Vive Le Confort! For Corseted Courtiers, This Dress Was A French Revolution A really old French dress has sold for more than $150,000. 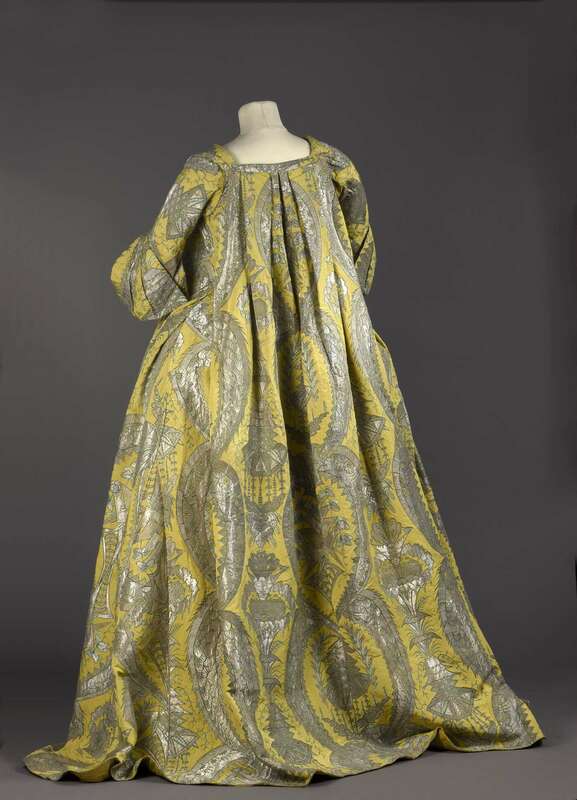 The brocade gown is an exquisite example of the loose-fitting dresses that women — fed up with restrictive bodices — embraced in the 1700s. 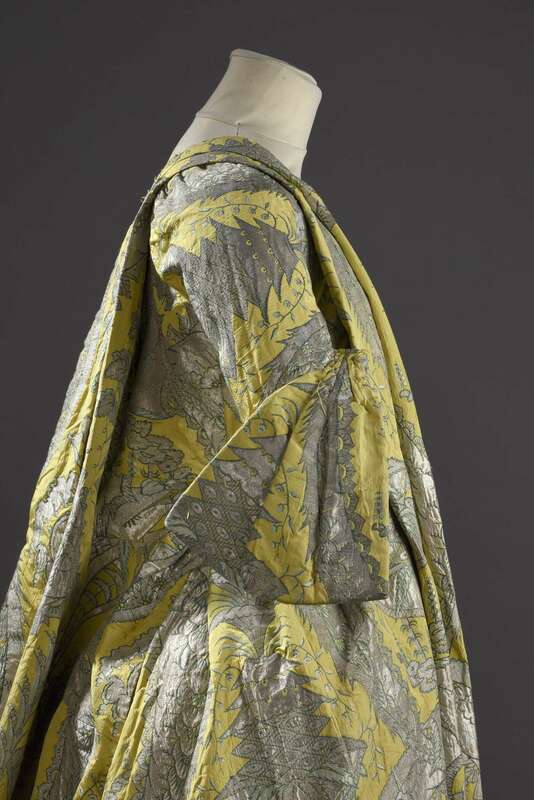 This rare 1700s robe volante, or "flying dress," was recently purchased by Palais Galliera, a fashion museum in Paris. It was purchased by Palais Galliera, a fashion museum in Paris. Curator Pascale Gorguet-Ballesteros says the robe volante is historically significant — for France and for fashion as a whole. 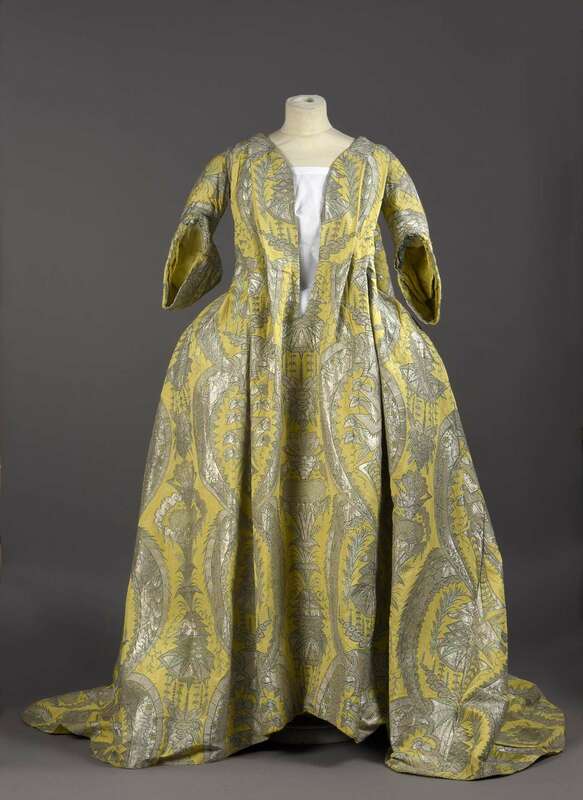 Before the sale, an auction house in Lyon sent textile expert Raphael Maravelle Utan to Paris by train to show the dress to prospective clients. "He brought it in a specially designed suitcase," says historian Joan de Jean, author of The Age of Comfort. While en route, a bid arrived by text — for over a 100,000 euros more than he expected. Utan held the suitcase closer, made his rounds in Paris, and went back to Lyon. For women used to wearing tight bodices, the loose-fitting robe volante was a welcome change. In Louis XIV's court, you had to dress in a certain way, de Jean explains: "You want to look formal, you want to look rich, you want to look powerful, you want to look impressive," she says. "That's what the court's about." For women, that meant luxurious fabric and tiny waistlines enforced by stiff, tight bodices. Courtiers had to be as formal and magnificent as possible. "Court dress was obligatory," says de Jean. "[Louis XIV's] idea was to have a look of the French court — that they were to look all the same. All formal, [so that] when his court was gathered around him, there would be this uniform style." In court, stylish women did a lot of standing around — all the bindings made it too hard to sit. But by the end of the 17th century, the formality began to wear thin and the magnificence became a burden. The robe volante had a deep V neck and billowing sleeves. "No one in France wants to get dressed up anymore," de Jean explains. "Everyone just wants to be comfortable." And so a fashion revolution was born: Down with the corsets and cages! Up with the robe volante! Full and comfy, in fancy fabrics or simple cottons, everyone could wear it — and they did. The "revolutionaries" were young women of the court, merchants and dressmakers; the robe became a social leveler. Visitors arriving in Paris found they couldn't tell who was who, de Jean says. Women could move differently. They could sit and lounge, cross their legs — even show a bit of leg. Painters started fixating on ankles and shins, showing the leg as "an object of desire," says de Jean. All this, from a new style of clothing! An exquisite example of that revolution is now at the Palais Galliera in Paris. There, it stands as a beacon of change and progress. Textile specialist Marie-Noëlle Sudre says that when you see it from across the museum, it's like looking at the sun.